Mari Inukai, Sena No Koe (Sena’s Voice), 2017, oil on canvas. Image courtesy of the artist. 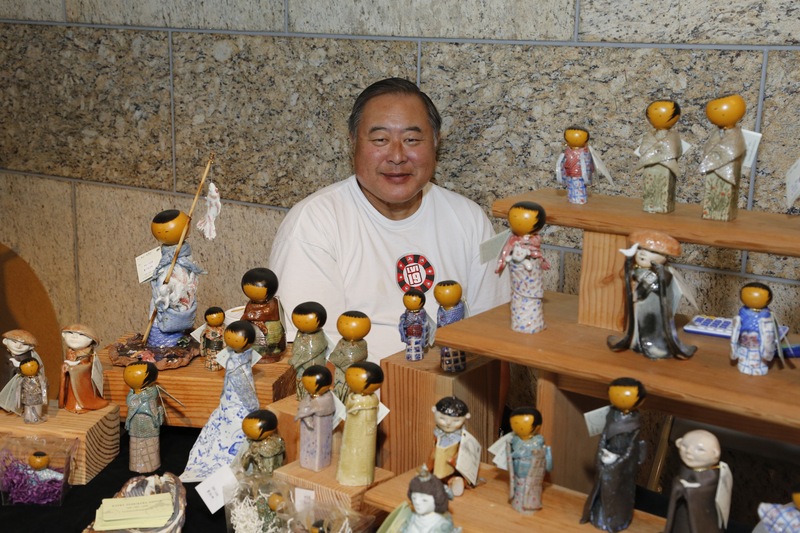 On Saturday, March 3, artist Mari Inukai will lead a sold-out kokeshi doll workshop in celebration of Hinamatsuri (Girls’ Day), which takes place that day. It’s no surprise that spots in this workshop went quickly, as the popular artist—whose dreamy paintings and animations often depict and are inspired by the lives of young girls—may be the perfect person to lead a celebration of Girls’ Day. Born in Nagoya, Japan, Inukai came to the United States in 1995 to study art. After attending Santa Monica Community College, she went on to obtain a BFA in character animation from California Institute of the Arts in 2004. Her short animated film, Blue and Orange (2003), has been an official selection at numerous film festivals, including the 2003 Sundance Film Festival, and was the Japan Grand Prize winner at the Short Shorts Film Festival EXPO 2005. In addition to her animation practice, Inukai regularly exhibits her paintings and drawings. She also designs clothes, toys, and other fun products. She now lives in Beverly Hills with her daughter Sena, who is often a subject of her artworks. According to her website, Inukai’s paintings are “an expression of her desires, ambitions, and hopes for the future, starting from where she stands now. Like water flowing, seeking its path, [she] channels her direction naturally, finding her importance as she travels forward.” We caught up with Inukai via email to ask her a few questions. JANM: What inspired you to create this workshop? Mari Inukai: March 3 is a special day for girls in Japan. Americans may be familiar with Hinamatsuri, but in Japan, that day is also known as Momo No Sekku (桃の節句), the peach harvest festival. The day marks the changing of the seasons, and peach blossoms are said to ward off evil; they also stand for longevity. I thought we should celebrate! Mari Inukai, Kingyo Hime, 2014, oil on canvas. Image courtesy of the artist. JANM: Why was it important to you to encourage collaboration among participants? MI: In the past, young Japanese girls would celebrate Hinamatsuri (ひな祭り) together by making dolls, eating sweets, and drinking sweet rice sake. I wanted to recreate that spirit in my workshop, so that we can all inspire and help each other and learn something new together and most of all, have fun! JANM: What is your own relationship to Hinamatsuri? Was it something you regularly celebrated back in Japan? MI: I have two sisters, so Hinamatsuri was pretty special when we were small. I remember our mom making chirashizushi (a colorful sushi dish), karaage (fried chicken), or tempura and salad. We would have a cute decorated cake with two dolls on top. There was a lot of laughter. No sake though! JANM: Looking through your extensive body of work, I see that girls are frequently the subject. MI: Yes. I paint my daughter Sena most, because she is the most inspiring thing in my life. I paint my friends and their children too. I am really fortunate to have great friends! JANM: Do you think that Japanese traditions, like Hinamatsuri, have influenced your own artwork? MI: Absolutely. Not just Hinamatsuri, but all Japanese traditions. In fact, I have curated a special MOMO/桃の節句 group show for Giant Robot that is also opening on March 3. I gathered several talented figurative artists whom I really admire and asked each of them to create their own “Momo No Sekku world.” I am doing a mural in collaboration with Audrey Kawasaki, and perhaps Amy Sol too. Amy has her own solo show opening on the same day at Thinkspace Gallery, so she will be in town. As for myself, I am making paintings with Gansai Japanese water color pigments, so they will look really different from my oil paintings. Please join us for the party! Sean Chao. Photo courtesy of the artist. Originally from Taipei, Taiwan, artist Sean Chao graduated from Art Center College of Design in 2007 and now makes his home in Los Angeles. 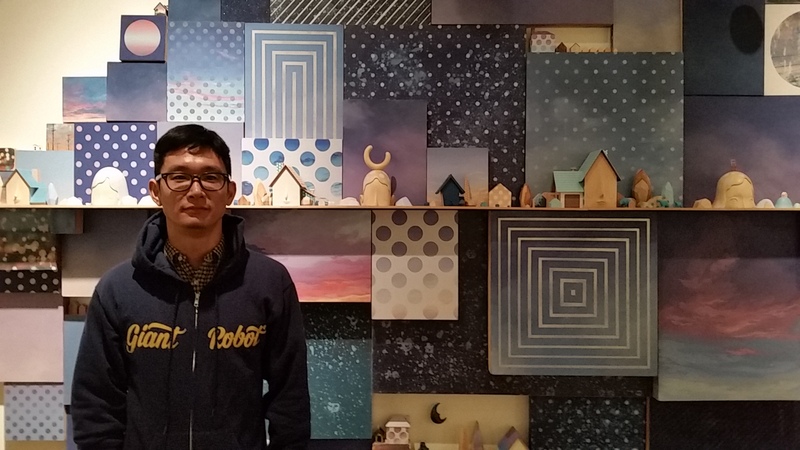 In 2012, Chao was featured in JANM’s Giant Robot Biennale 3 exhibition. He is known for creating intricate miniature dioramas using polymer clay, basswood, and paper, with nature as a recurring theme; he often depicts dense forests or vast oceans filled with plants and wildlife. 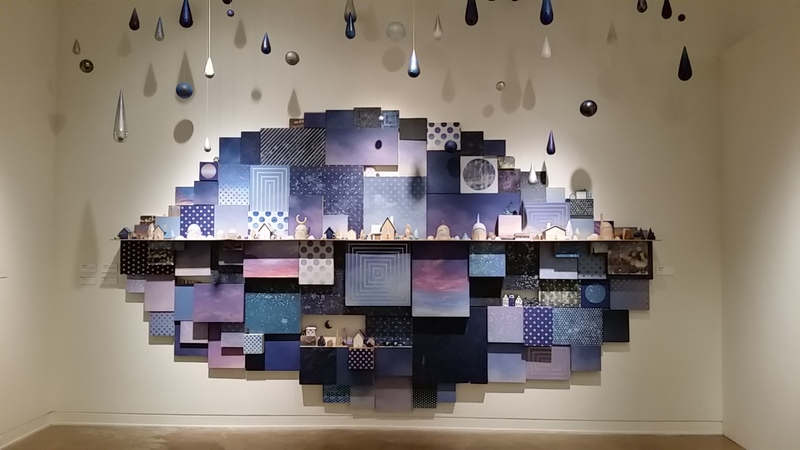 This Saturday, January 16, Chao will be leading a workshop at JANM titled Water Memory. Participants will learn to create their own sculptural underwater scenes using polymer clay, acrylic paint, and paper. In advance of this workshop, Chao graciously agreed to answer a few questions via email regarding his process and his influences. JANM: How did you become interested in making dioramas? Sean Chao: Growing up, I was very intrigued and fascinated by the dioramas at various natural history museums I visited, both in Taiwan and here in the States. It amazed me, the many details that were put into the dioramas to recreate natural scenes. It’s a different dimension—frozen in time and locked in a clear display case. One day I just decided to create my own dioramas, filled with worlds that I create. paint on wood panel. Photo courtesy of the artist. JANM: Tell us about some of the inspirations that drive your work. Monkeys and country peasants seem to make frequent appearances. SC: I grew up in Taiwan and my culture influenced my work tremendously. I grew up in the city, but I was always fascinated by the simplicity of peasant life in the country—so much closer to nature and so far away from the crowd. My dioramas are fantasy worlds that I create. Anthropomorphic characters are very charming. They have their own personalities in my world, inspired by the people and animals around me. My brother was born in the Year of the Monkey and he is one of my best friends. My monkey character is based on his personality: smart and adventurous. and gouache paint on wood panel. Photo courtesy of the artist. JANM: You also have an interesting “creatures within creatures” theme going on, where robots are controlled from the inside by animals. Could you tell us more about this theme? SC: Human beings create computers, robots, and artificial intelligence based on the likeness of ourselves. It’s in our nature to create. I simply created my own version of the robot. It’s based on an ideal human personality and controlled by characters that were inspired by my family and friends. JANM: Who are some of your own favorite artists? SC: Beatrix Potter—she was an illustrator, natural scientist, and conservationist, and one of my favorite children’s book illustrators. Hayao Miyazaki—I grew up watching his animations. The stories are very touching for both children and adults, and the way he captures the personality of each character is just fascinating. There is definitely more to learn from him for my own work. Learn to make a piece like this in this weekend’s Water Memory workshop. on wood panel. Photo courtesy of the artist. JANM: What are you most excited about for your upcoming Water Memory workshop? SC: Meeting people who share the same interest in sculpture and diorama, and of course I’m very excited to show them my techniques. It will be a real fun event. Space is still available for Chao’s workshop. To register, click here. Katsuya Terada at work in the JANM galleries. Photo by Carol Cheh. Giant Robot Biennale 4 is a highly interactive show, with several features that invite viewer engagement on a more active level than usual. One of these features is the live, on-site creation of a major new work by Katsuya Terada. Starting shortly before the exhibition opened in October, Terada spent several days working inside of a roped-off area in JANM’s lower-level galleries to create a new, two-part drawing from scratch. Visitors were able to watch him as he worked. The artist had to leave town before he could finish, but he plans to return later this month (after the 19th) to complete the piece in the gallery. The live drawing idea came from Eric Nakamura, curator of the show and founder of the Giant Robot empire. “Museums are typically filled with static objects,” he noted. 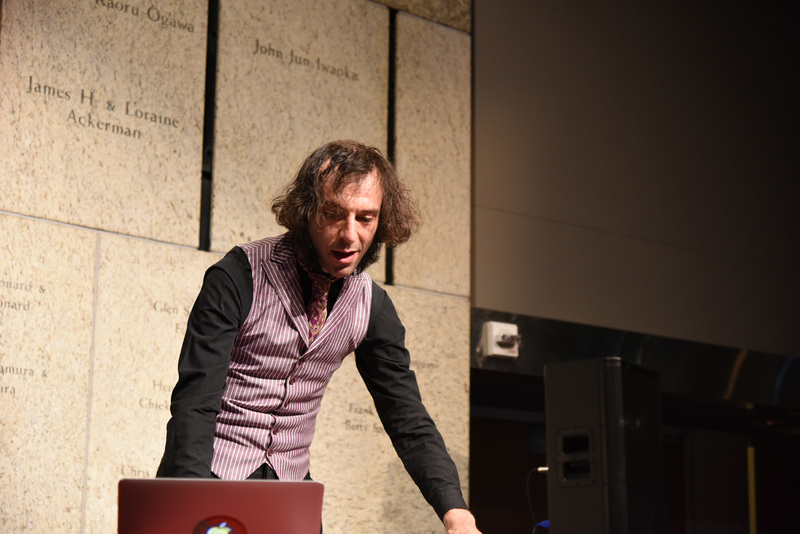 “I wanted to present an interactive experience, where people could ask questions, and see what artists are like in person. It’s not everywhere that you can do this.” Nakamura gave Teraya no time limits, wanting him to produce a finished work that is suitable for framing. So far the work is looking exquisitely finished right out of the gate. It does not yet have a title, but it does have a theme: masks. “I thought it would be interesting to draw a mask wearing a mask,” the artist says. Terada, who speaks very little English, spoke to me shortly before he left with the help of his friend and fellow exhibiting artist Yoskay Yamamoto, who served as translator. Katsuya Terada. Photo by Carol Cheh. Personally, I would find that process stressful. I asked him how he felt about that, and about having people watch him while he draws. Terada will be back at JANM sometime after December 19th to complete his drawing. Keep your eyes on JANM’s Twitter feed and Facebook page to see when he’s in the gallery. Until then, you can come to the museum to view his progress to date. JANM later this month to complete the work. Photo by Carol Cheh. Yoskay Yamamoto in front of his artwork, Wish You Were Here. 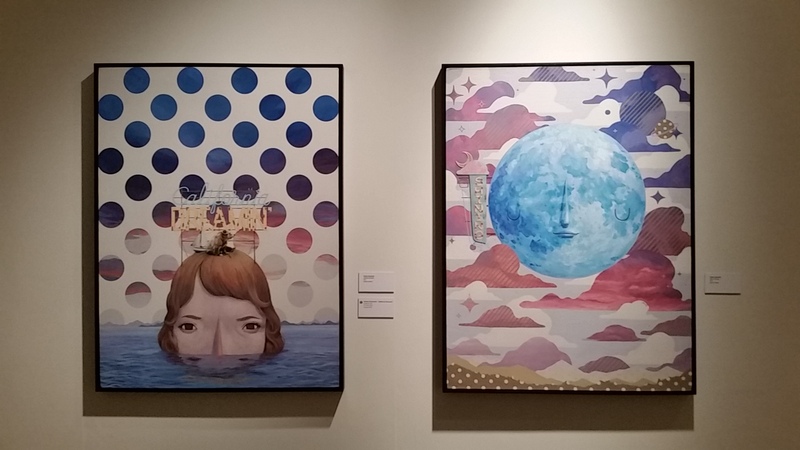 Giant Robot Biennale 4 is filled with outstanding artworks. One of the most attention-grabbing is perhaps Yoskay Yamamoto’s Wish You Were Here, a complex, wall-mounted installation composed of numerous small paintings, photo-transfer panels, hand-carved wooden sculptures, and hanging objects. Displayed near the back of JANM’s upper-level galleries, Wish You Were Here stuns viewers with its exuberant presence. Shortly before GRB4 opened, Yamamoto graciously answered a few questions about this work and the others he has in the show. JANM: Did you custom-make Wish You Were Here for this exhibition? Yoskay Yamamoto: Yes. 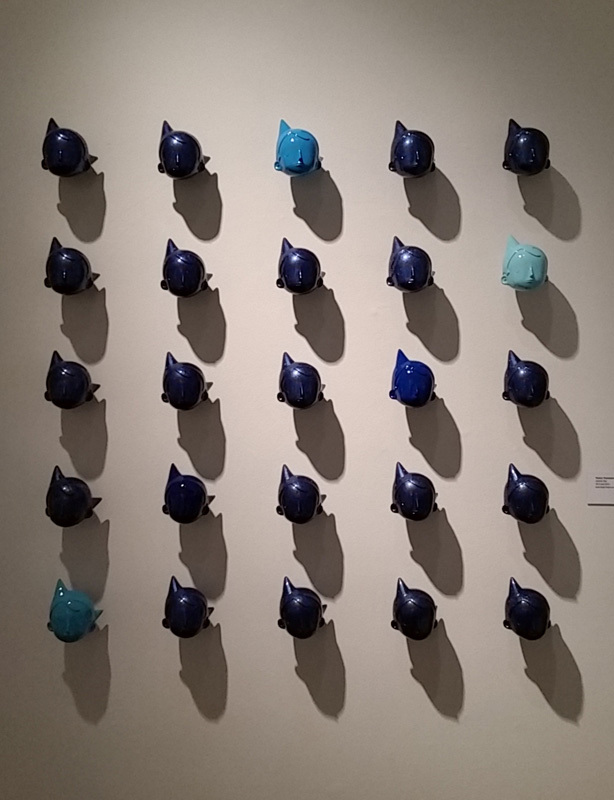 This is a type of installation that I’ve been working on since 2012; I think that was the first time I did something with the panels and suspended sculptures together as one piece. From there, I gradually added more panels, and repainted more, adding different color palates and textures. 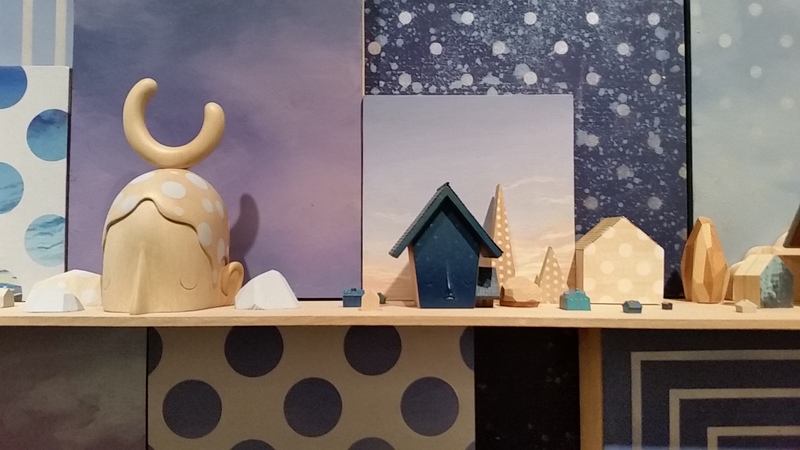 The latest additions are the sunset hues and scenery, painted to fit into this particular kind of color palette. Yoskay Yamamoto’s Wish You Were Here. JANM: What were the inspirations behind this piece? YY: The sunset is one of the main visual elements in the 100 panels I brought here. Ever since I started living in Los Angeles, I’ve been fascinated by how beautiful the sunset is in the city. At the same time, I’ve heard it’s due to the smog we have. I find this ironic. If I’m outside at the right time, I try to photograph the sunsets I see. Then I use a lot of them as reference. JANM: So you were born in Japan? YY: Yes, in this small seaside town called Toba, which has a population of about 22,000. It’s decreasing every year because the younger generation ends up leaving to go to bigger cities. Yoskay Yamamoto’s California Dreamin’ and Keep On Shining. JANM: What brought you to California? YY: Toba is a sister city to Santa Barbara, so I went to high school there and then studied graphic design at the community college. To pursue my art, I moved to San Francisco for about a year. Then, ironically, I got assigned to a gallery in LA. So I packed up my stuff and moved down here. JANM: Can you tell us about the other three pieces you have in the show? YY: The smaller wall installation is called Cosmic Boy. I bought a bootleg Astro Boy figure from Hong Kong on eBay, and I just took the head off and re-sculpted it. Then I had my friend fabricate 25 of them for me. I also have two paintings here called Keep on Shining and California Dreamin’. These are both based on the old Americana signage that I see around LA. I think this is something that’s dying in culture—I don’t think anybody is making these signs any more. I like seeing the craftsmanship in them—there’s something special and magical about it. I try to pick some titles or combinations of words that I like, to give a positive message to them. Giant Robot Biennale 4 is on view at JANM through January 24, 2016. Giant Robot Biennale 4 is now on view! Having fun inside of kozyndan’s custom vinyl mural, Heat Run Samadhi. Since 2007, JANM has partnered with Giant Robot founder Eric Nakamura to produce the Giant Robot Biennale, a recurring art exhibition dedicated to showcasing the diverse creative works brought together under the ethos of the popular brand. 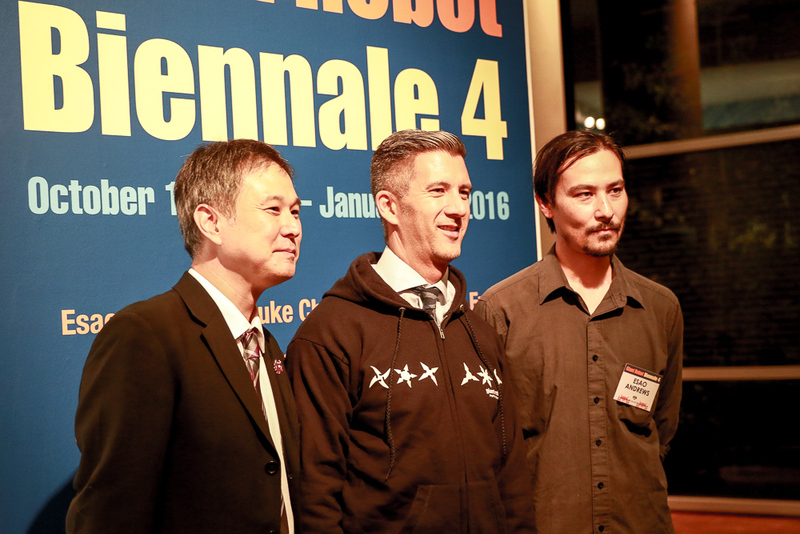 The latest edition, Giant Robot Biennale 4, examines the evolution of the Giant Robot aesthetic from its humble origins in drawing to its many celebrated manifestations in painting, installation, muralism, and photography. This past Saturday night, GRB4 had its grand opening celebration. 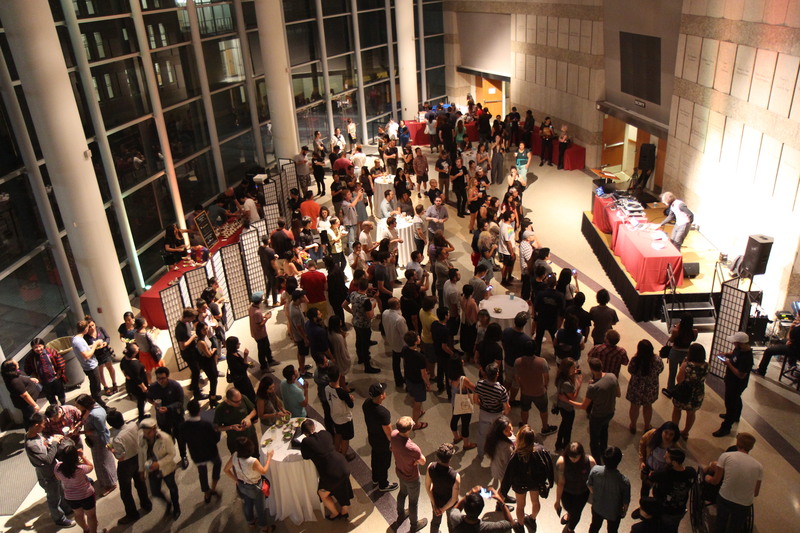 More than 2,000 guests gathered at the museum for a lively evening of art, music, food, and crafts. Enjoy the photos that follow! 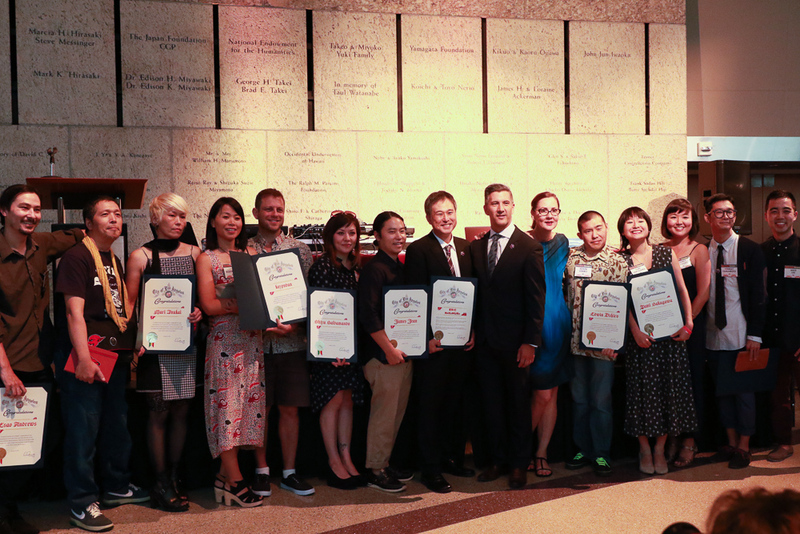 Certificates of appreciation were given to curator Eric Nakamura and each of the GRB4 artists by Danielle Brazell of the City of Los Angeles Department of Cultural Affairs. 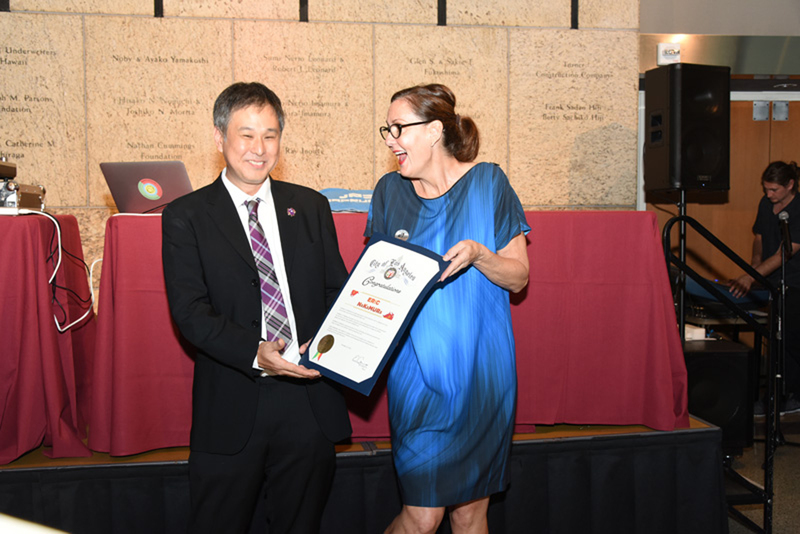 Danielle Brazell of the Department of Cultural Affairs, right, presents curator Eric Nakamura with his certificate of appreciation. Photo by Nobuyuki Okada. More than 2,000 people attended the opening night festivities. Photo by Richard Murakami. designs started by GRB4 artists. Photo by Ben Furuta. A family makes buttons together. Photo by Ben Furuta. Excited guests line up to have their designs pressed into buttons. Photo by Nobuyuki Okada. 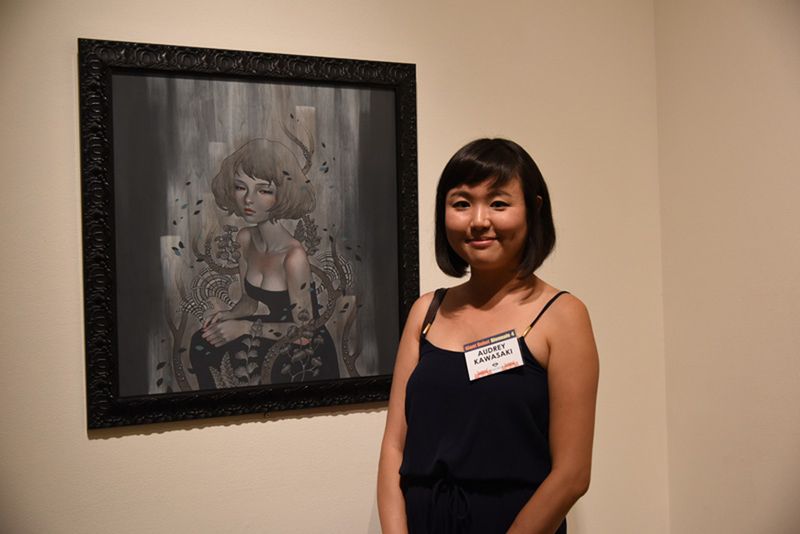 Artist Audrey Kawasaki poses in front of her artwork. Photo by Nobuyuki Okada. 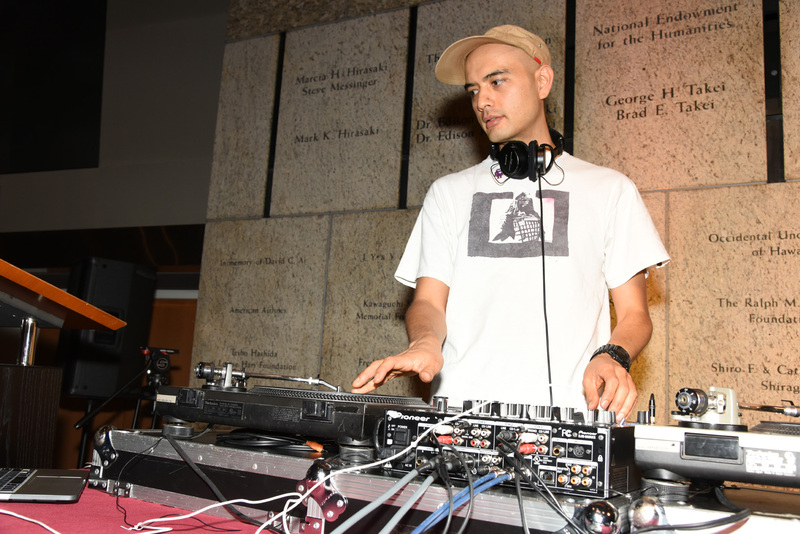 Dublab spins some tunes to keep the party going. Photo by Nobuyuki Okada. 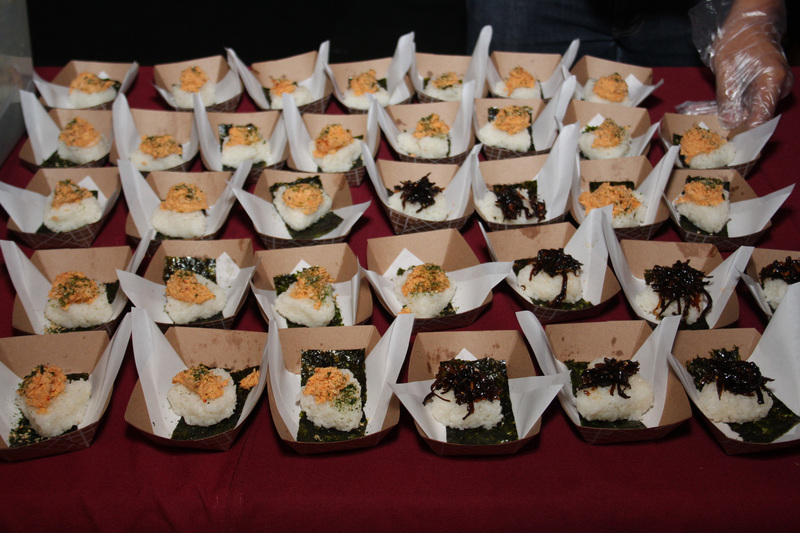 Tasty bites were provided by Mama Musubi. Photo by Richard Murakami. 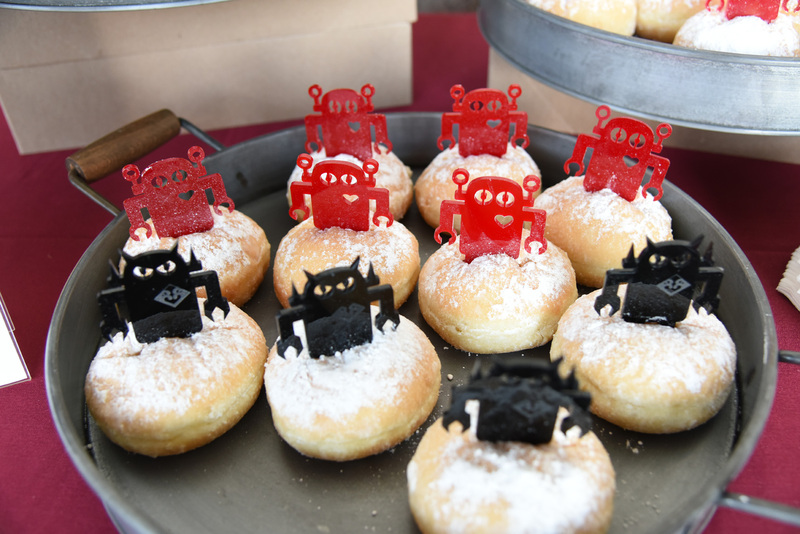 Cafe Dulce also got in the spirit with special Giant Robot x JANM donuts. 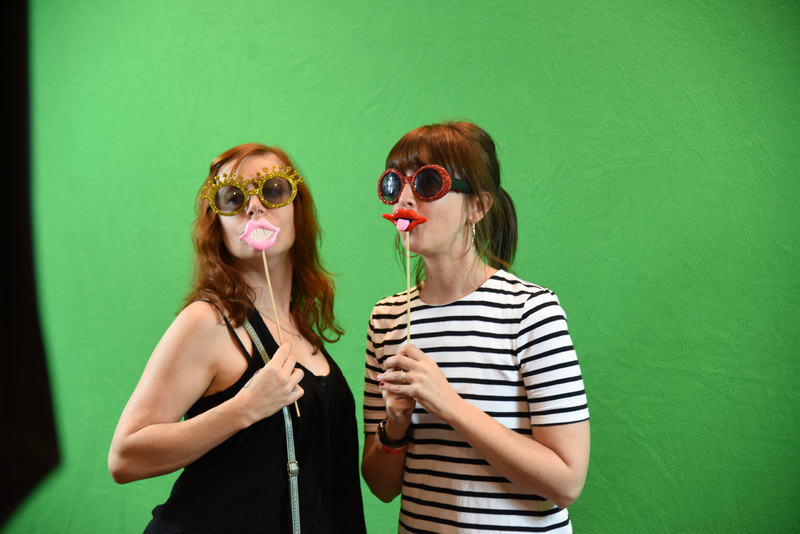 Nerdbot’s Photo Booth brought out the flair in everyone. Photo by Nobuyuki Okada. 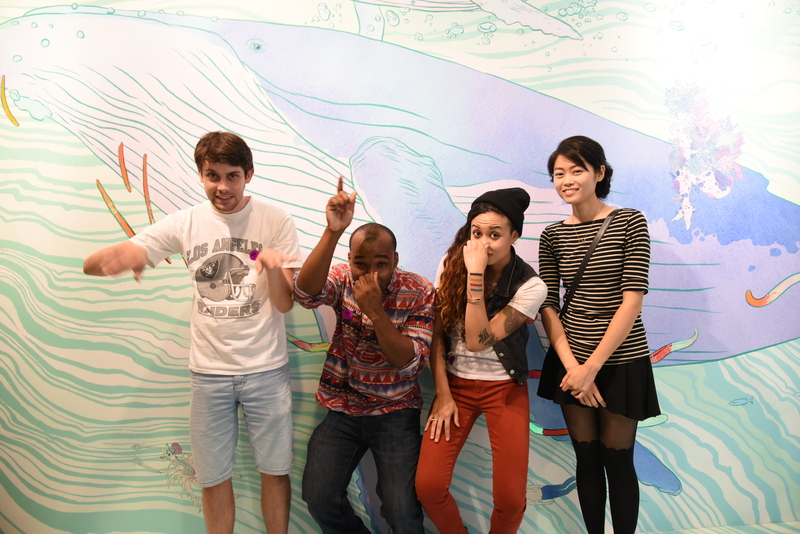 Eric Nakamura, right, and a few of the artists admire kozyndan’s mural. 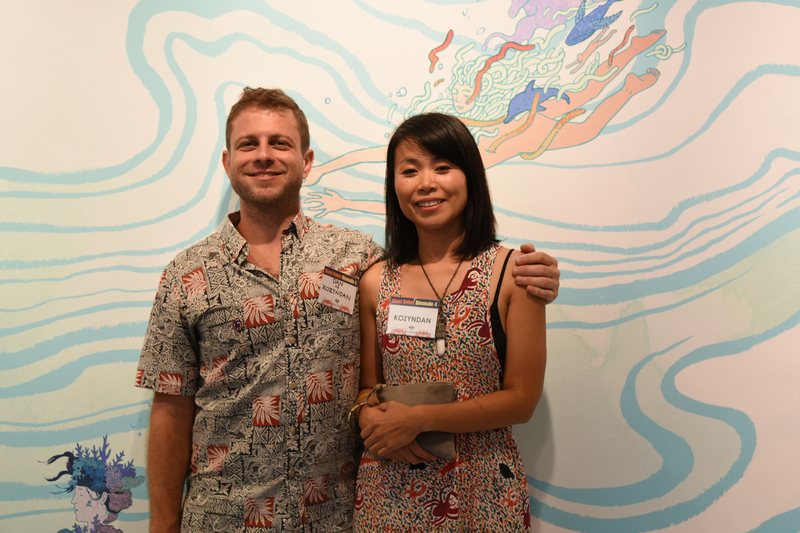 Kozue and Dan Kitchens, aka kozyndan, pose in front of their work. 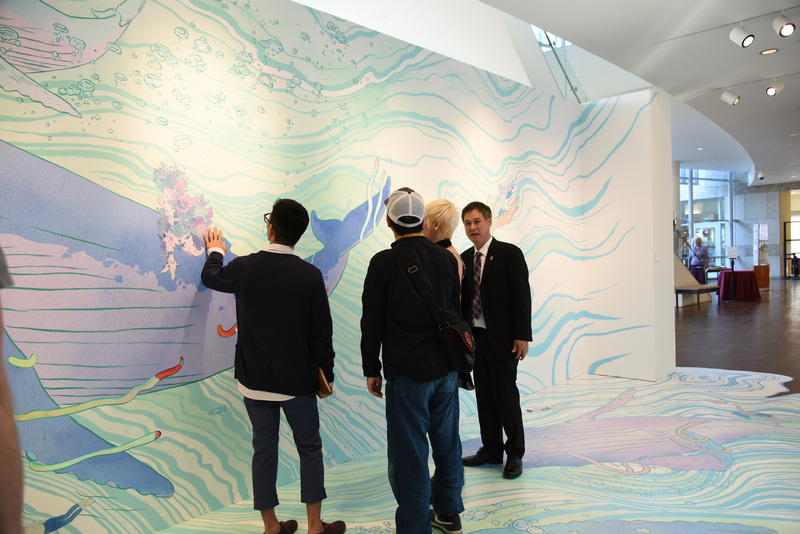 People couldn’t get enough of kozyndan’s mural! Photo by Nobuyuki Okada. 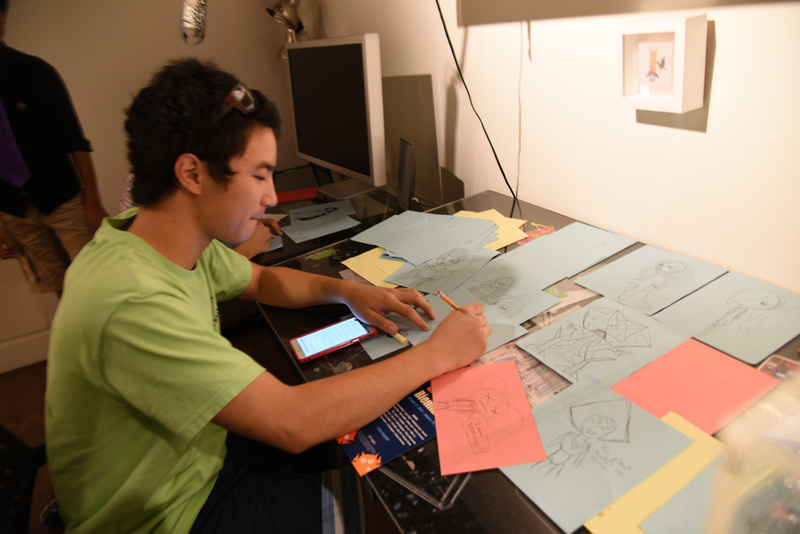 A guest tries his hand at drawing inside a replica of artist Edwin Ushiro’s studio. 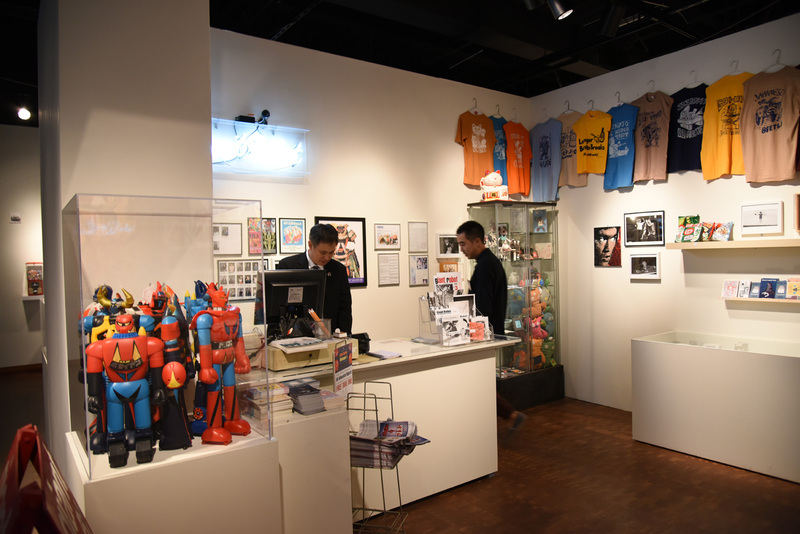 in the replica Giant Robot store. Photo by Nobuyuki Okada. 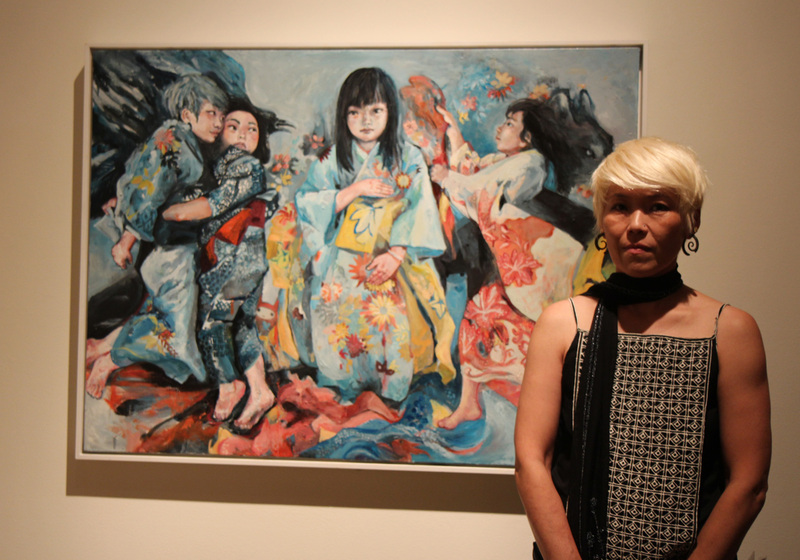 Artist Mari Inukai in front of her painting. Photo by Richard Murakami. Ray Potes of Hamburger Eyes poses in front of the collective’s installation. 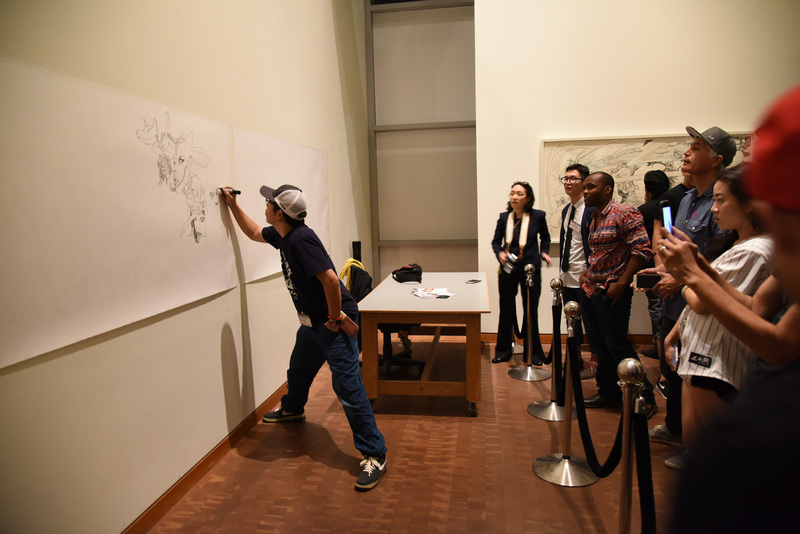 Katsuya Terada wows onlookers with his live drawing skills. Photo by Nobuyuki Okada. 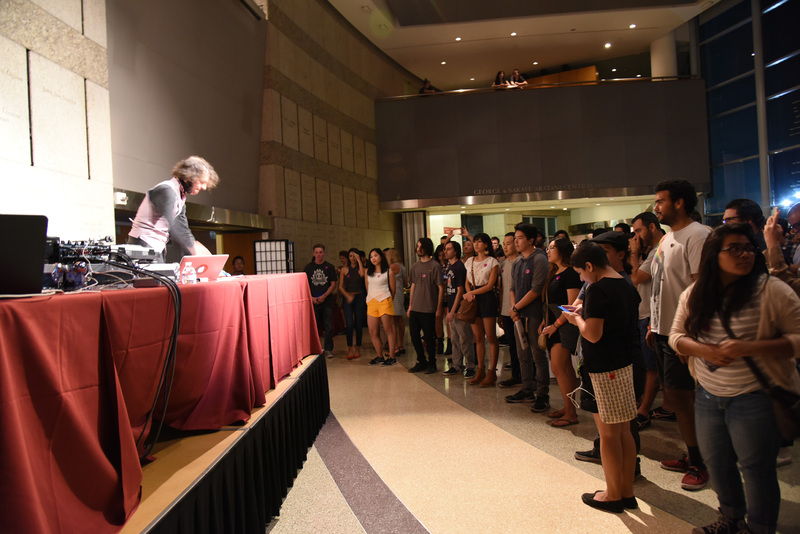 A crowd gathers to watch electronic musician Daedalus. Photo by Nobuyuki Okada. Daedalus in action. Photo by Nobuyuki Okada. Nisei Week Court! Photo by Nobuyuki Okada. Curator Eric Nakamura, JANM President and CEO Greg Kimura, and artist Esao Andrews. Photo by Steve Fujimoto. 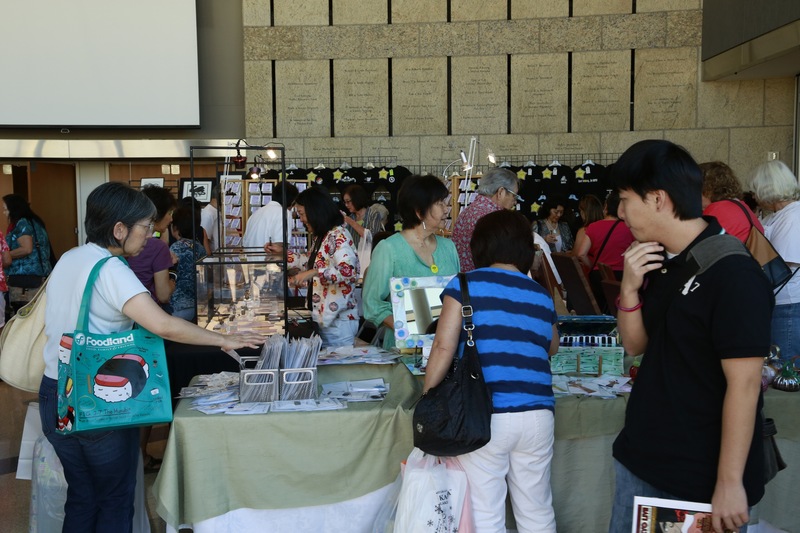 Shoppers at the Kokoro Craft Boutique are busy hopping from one booth to another. 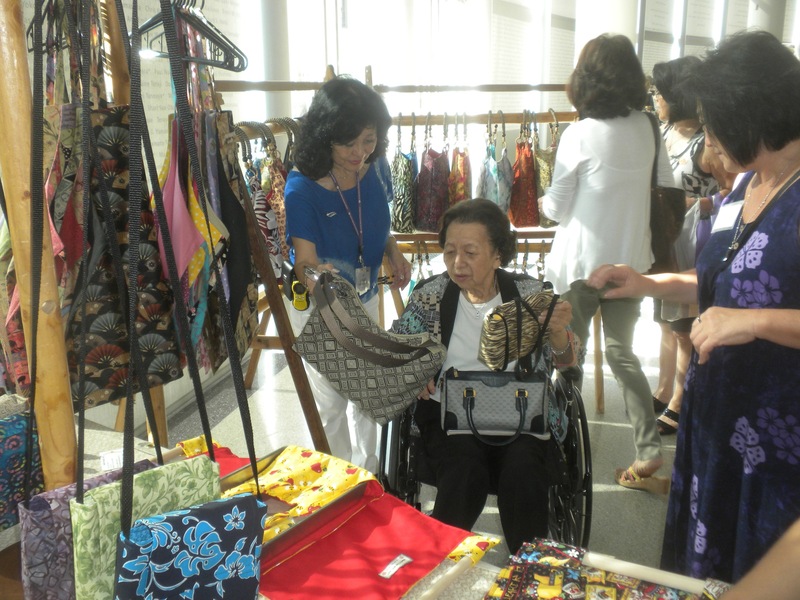 On Saturday, October 5, 2013, the Friends of the Museum hosted the Kokoro Craft Boutique at JANM. The boutique showcased and sold a wide variety of unique, artisan-quality items. 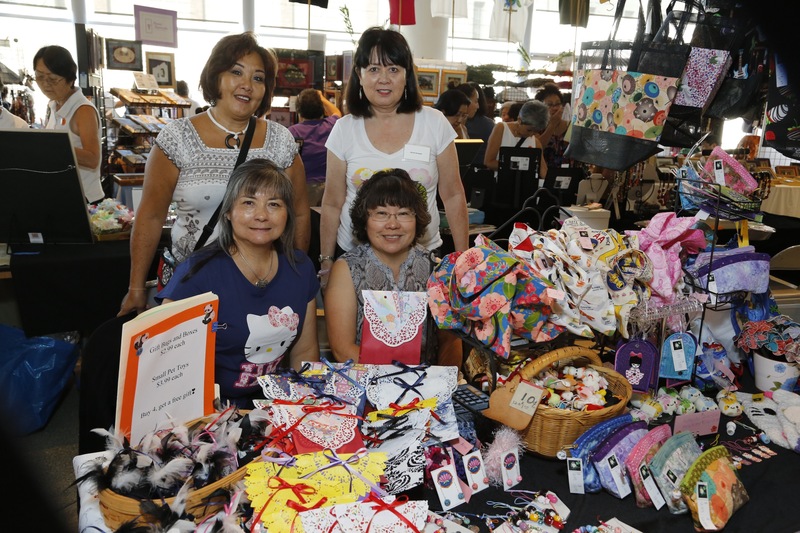 Shoppers enjoy the wide variety of crafts at the 2013 Kokoro Craft Boutique. 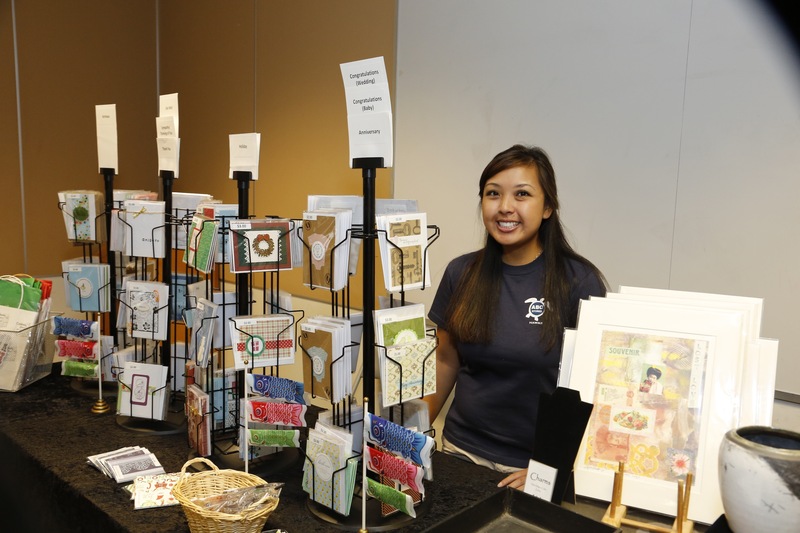 The 2013 Kokoro Craft Boutique was a huge success. 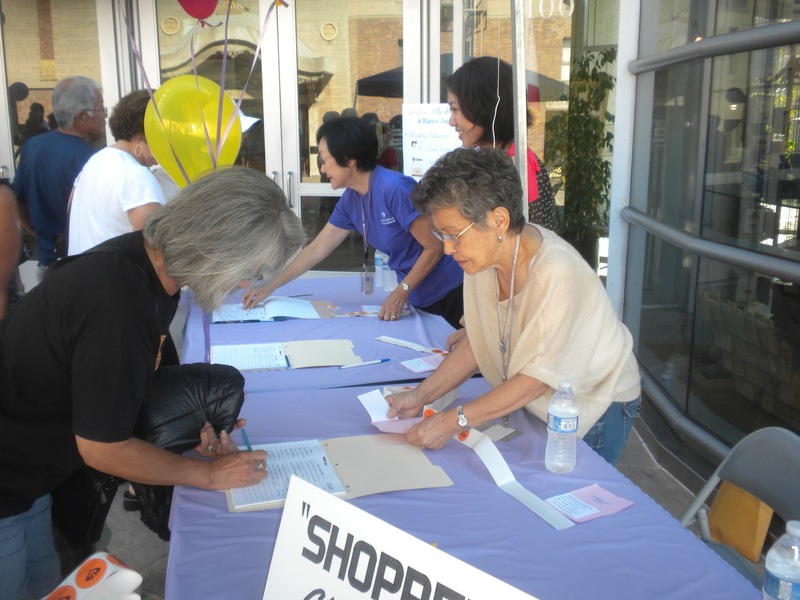 Over 1,300 shoppers visited the boutique! There were 50 Vendors with beautiful, creative, and unique crafts, including Giant Robot merchandise, cultural T-shirts, 3-D & bronze art, vendor-designed jewelry, handbags, tote bags, clothing, scarves, pottery, original artwork, and more! All shoppers appreciated the perks as they shopped. 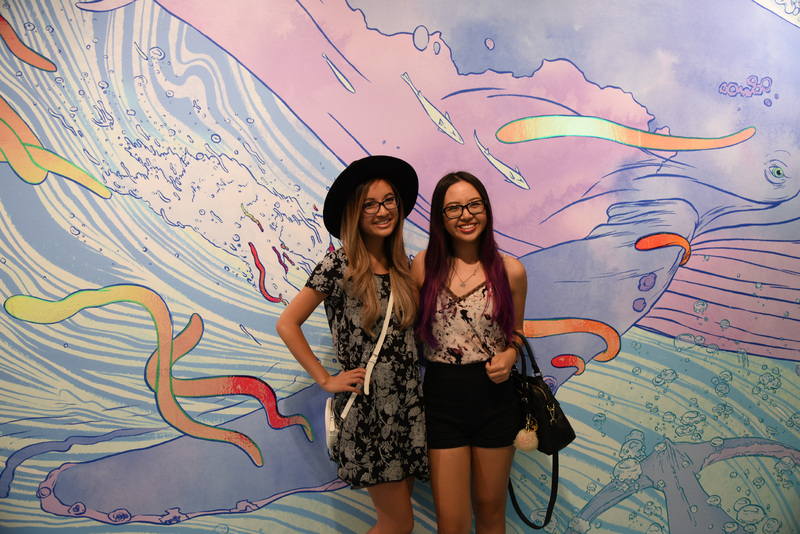 By spending $10 or more at the Boutique, shoppers received free admission to the Museum’s exhibitions for that day, and a 10% discount during the month of October at participating Little Tokyo restaurants! 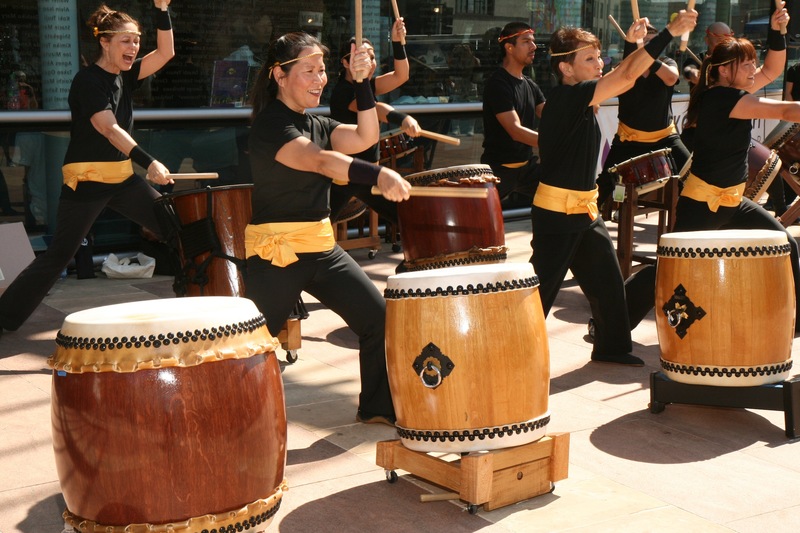 Yuujou Taiko gave a powerful performance on the Plaza. 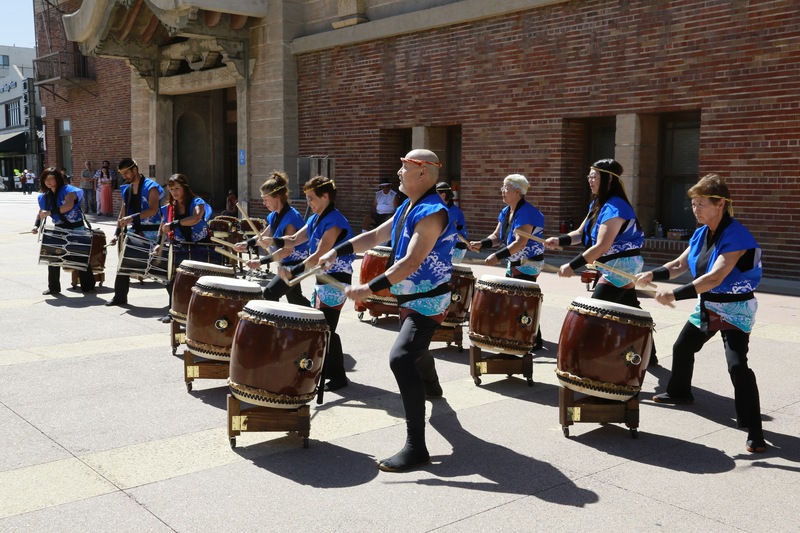 Yuujou Taiko’s performance on the Plaza drew a very large crowd. Their talent and enthusiasm captivated an audience who didn’t seem to mind standing in 93-degree weather! Thank you to all who came to shop and support the Museum. The Friends of the Museum will be able to donate a generous amount to the Museum’s Educational programs. Watch JANM’s Events Calendar next year for the date of the 2014 Kokoro Craft Boutique! Preparing for a busy day at the Boutique. Adrienne Lee sells “Color Conscious” jewelry at the Boutique. 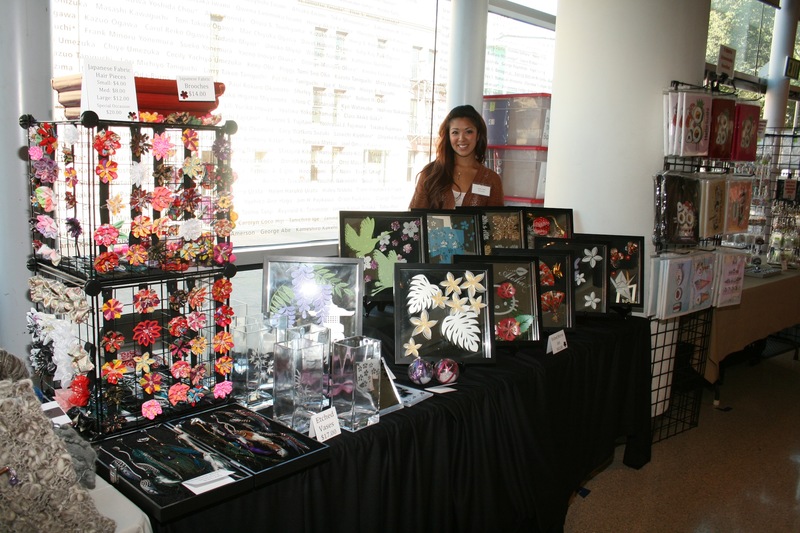 Crystal Agena displays beautiful accessories from “Aloha Inspired”. 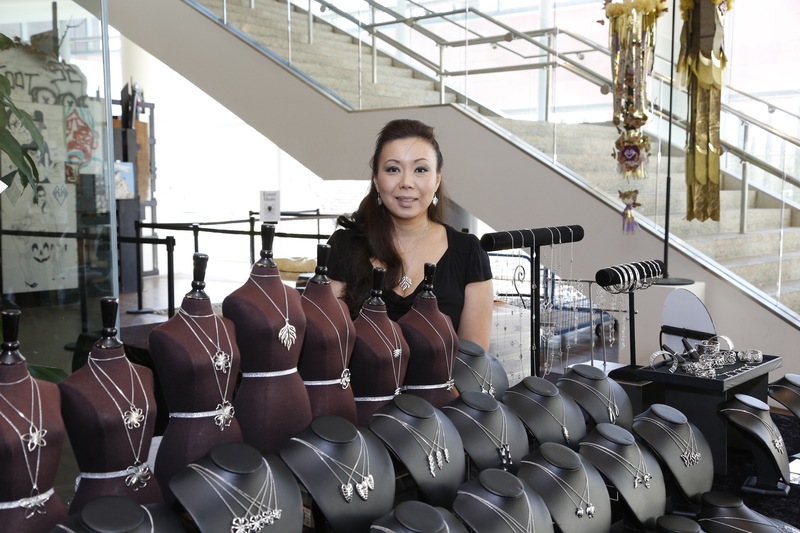 From charms to jewelry, Daniel Aoki sells Clayvision’s unique and affordable gifts. June Berk manages Fugetsu Do’s sweet booth! 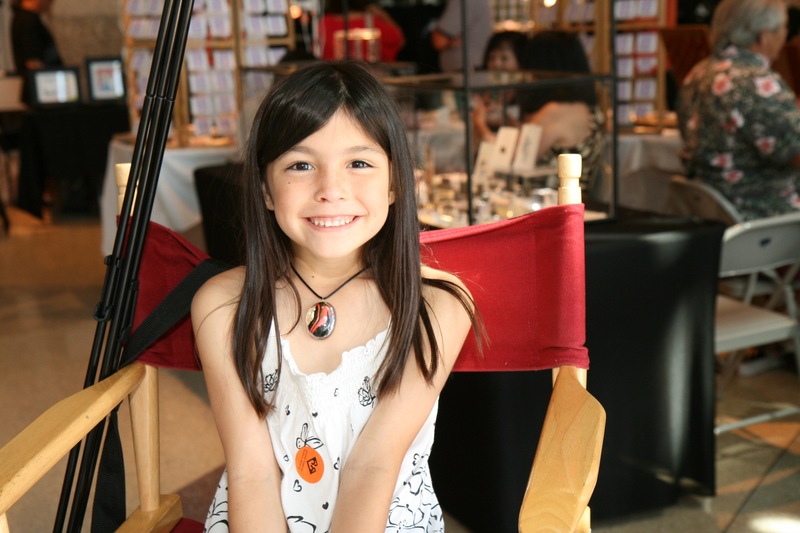 Karolyn Fujimoto sells her wonderful designs at the Boutique. Every corner of JANM is filled with booths! Yuujou Taiko perform on the Plaza. Kaz Ota sets up an extensive display of clay pottery. Marisela Delgado represents “La Petite Deer”, with a colorful booth. 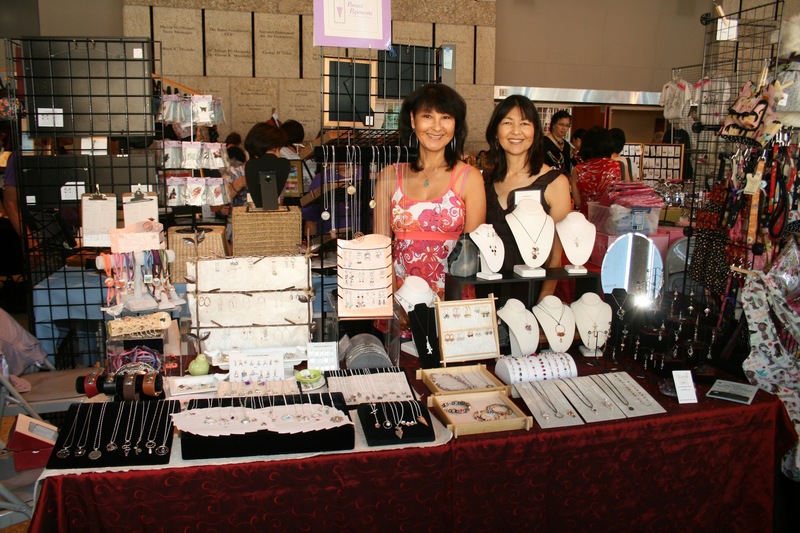 The Friends of the Museum, including Tachi, Grace, Sande, Janet, and Nobi, organized a wonderful boutique this year! Photos by Tsuneo Takasugi, Richard Murakami, and Russell Kitagawa. Don’t miss exciting events like this at JANM! Stay updated on all our events by visiting janm.org/events or “liking” our JANM Facebook page! 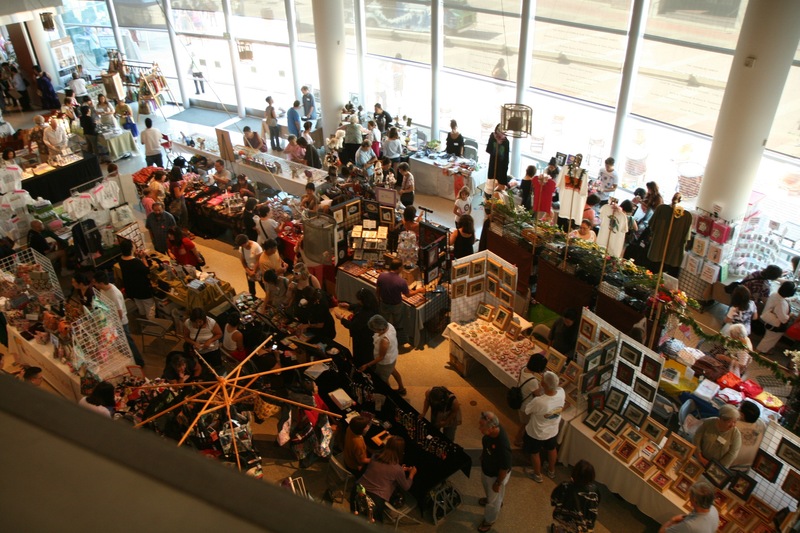 On Saturday, October 5, 2013, the Friends of the Museum will host the Kokoro Craft Boutique at JANM from 10AM to 4PM. Proceeds will benefit JANM’s educational programs. Don’t miss this free showcase and sale of unique, artisan-quality items! 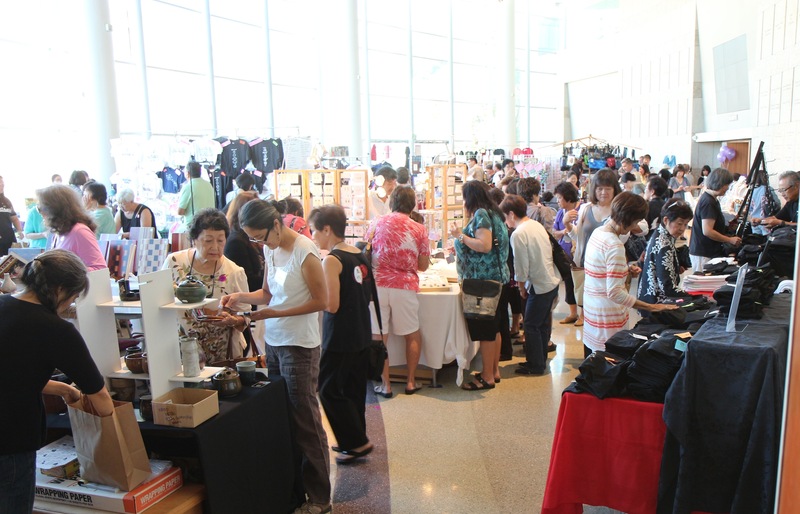 There will be 50 vendors in the craft boutique—including 3-D art, jewelry, kimono fabric fashions, woven & silk scarves, origami, handbags, cultural t-shirts, pottery, ceramics, bronze art, and more! This boutique will also feature crafts from Asian American pop culture juggernaut, Eric Nakamura of Giant Robot. 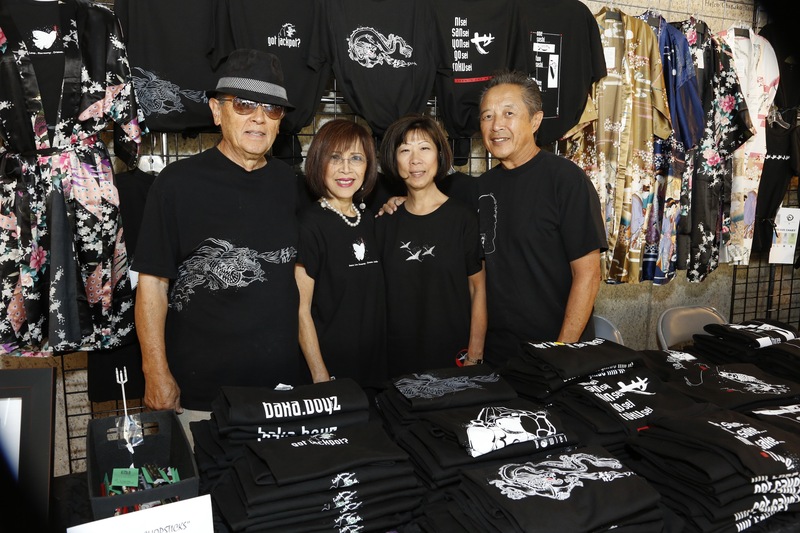 The Kokoro Craft Boutique will not only showcase and sell a wide variety of unique items, but there will also be taiko drumming by Yuujou Taiko at 1pm, and the Lomo Arigato Peruvian-Japanese Fusion Gourmet Truck will be selling their delicious food on the plaza. 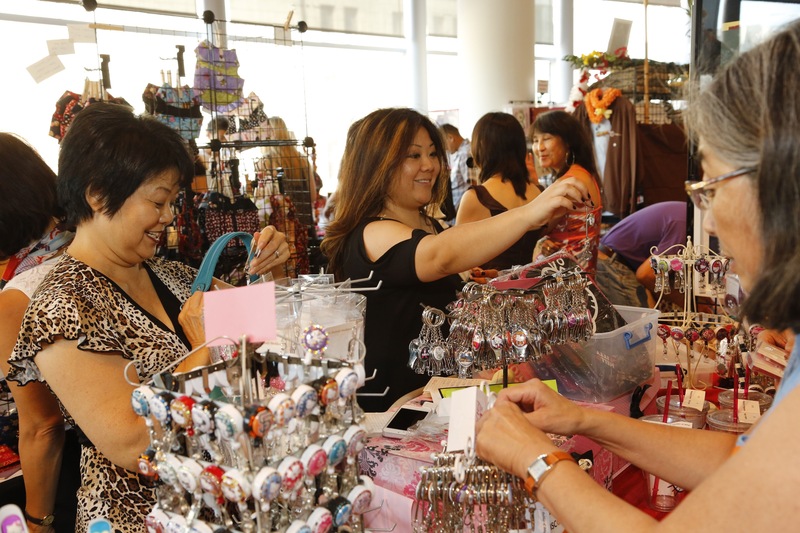 A purchase of $10 or more at the boutique will provide you with free admission to the Museum’s exhibitions, and also with a 10% discount at participating Little Tokyo restaurants. 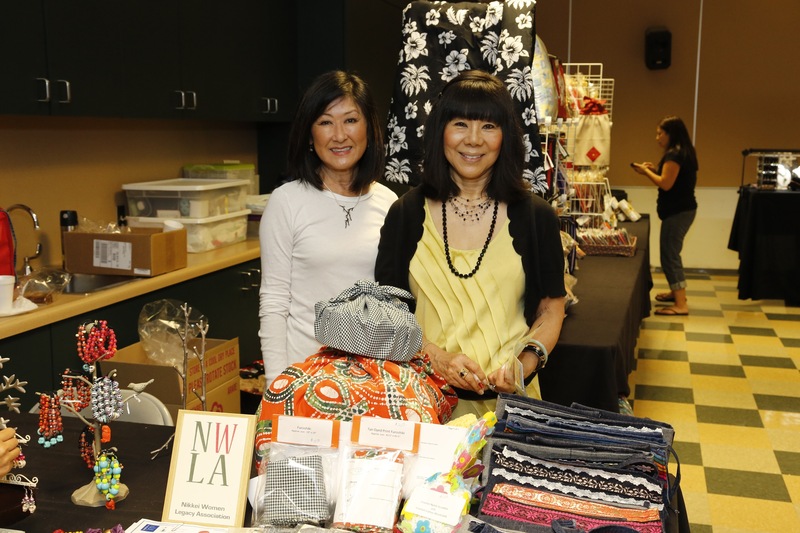 Check out these photos from last year’s Kokoro Craft Boutique held at JANM! 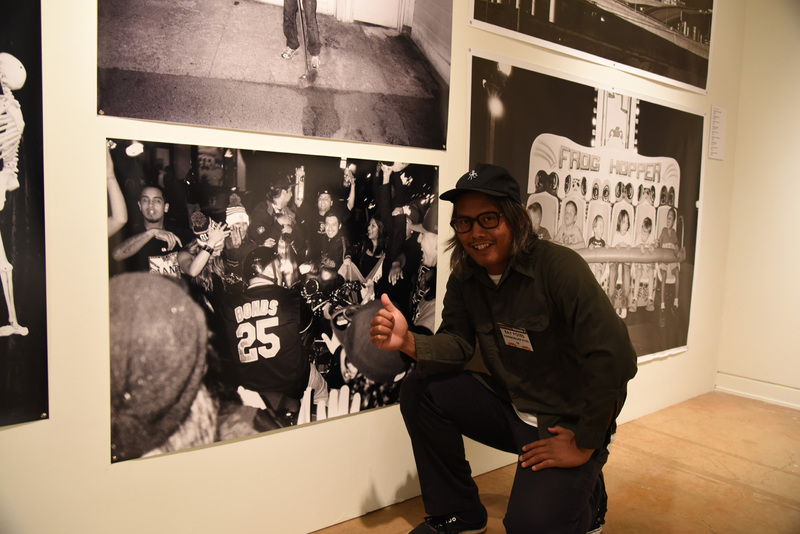 Photos by Russel Kitagawa, Richard Murakami, and Richard Watanabe. For more information on the Kokoro Craft Boutique, email kokorocraft@gmail.com. For Museum hours, admission rates, and information, visit janm.org. The Japanese American National Museum is located on the corner of 1st & Central. Public parking or transportation via the Metro Gold Line to “Little Tokyo/ Arts District” are available. 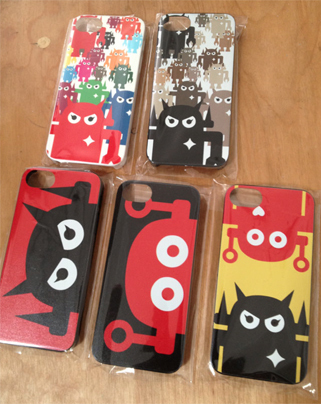 Our longtime friends at Giant Robot are selling Tru Protection iPhone 4 and 5 phone cases featuring their robotic mascot! These fun cases are locally made and recyclable—and better yet, a portion of the proceeds are donated to JANM! Stop by booth #1729 and make your phone the envy of them all. And for the first time ever, Hello Kitty is debuting at Comic-Con! Sanrio will offer a pop-up shop, nail art, and an interactive experience based on Alice in Wonderland, located at Comic-Con’s Interactive Zone. Marvels & Monsters: Unmasking Asian Images in U.S. Comics, 1942-1986 officially opens on October 12—but we know you’ll join us for the opening party on Thursday, October 10 too! Marvels & Monsters illustrates how racist comic book archetypes affected the way Americans viewed Asians. For more information, pick up a postcard at Stan’s booth. Hello! Exploring the Supercute World of Hello Kitty will open in October 2014, just in time for her 40th anniversary. As you’ve probably guessed, Hello! will look back on four decades of Hello Kitty’s influence on art and culture. Stay posted for more info! Giant Robot Biennale 3 closed this past Sunday but not without some cool happenings. As part of what we called Giant Robot Artists’ Entourage, some of the GRB3 artists came to teach their techniques and share a bit about their art making process. Eric Nakamura, Albert Reyes, Saelee Oh, and Rob Sato, were super-generous with their creativity and led several great art making workshops and discussions. On Saturday we concluded the GR Entourage program with a watercolor workshop by Rob Sato. In addition to the public workshops, a major part of Giant Robot Artists’ Entourage was a series of workshops for high school students. The result was a display of work that was produced during the workshops AND as an added bonus, last Friday a group of students from our neighbors at Mendez Learning Center came by for a visit! This great group of people included two of the Entourage participants who helped lead their teachers and fellow students through the GRB3 exhibition and the display of their work. It was the perfect way to continue the learning and conversation. Big thanks to all the artists who shared with us and to the students and teachers from Mendez Learning Center and The Los Angeles School of Global Studies. We had a great time with you all! Support for the Giant Robot Entourage program is provided by the National Endowment of the Arts. After going through the galleries with Eric, students had a chance to customize their own Big Boss Robot. Students in the galleries discuss Ako Castuera's work. Display of student artwork created during workshops with Eric Nakamura, Saelee Oh, and Albert Reyes. Many thanks to Richard Murakami and Gary Ono for taking photographs to document the workshops! Stan Sakai, JA Santa, & GRB3 artists workshop this Saturday! This Saturday will be another busy day at JANM! We’ll have 3 great reasons to visit us with your friends & family. Japanese American Santa is coming to town! Take home a special holiday photo. Usagi Yojimbo books available at the Museum Store! Come make art with Albert Reyes and Saelee Oh from Giant Robot Biennale 3 in this hands-on workshop. Immerse yourself in a variety of techniques and styles. Open Love Letter to the Universe: We will be creating lots of artwork together! You can make portraits of your spirit animals, make artwork as an amulet for healing and protection for yourself and to give out to others and to illustrate our wishes for our world to be a better place. Saelee Oh installation in "Giant Robot Biennale 3"
All three events are free with Museum admission (if you’re a member, that means it’s all free!). While you’re here, be sure to check out the Giant Robot Biennale 3 exhibition (closes January 20, 2013). If you haven’t finished your holiday shopping, find meaningful & fun cultural gifts at our award-winning Museum Store. We have many more items—including one-of-a-kind ceramics, jewelry, and art pieces—than what is available online at janmstore.com.